It's one of my favorite foods ever. A creation straight out of Philadelphia, PA, the cheesesteak sandwich combines thinly sliced steak, melted cheese, and maybe some veggies (peppers, onions, mushrooms) in a long hoagie roll. It is glorious, greasy deliciousness and there are many tasty versions out there in San Diego. 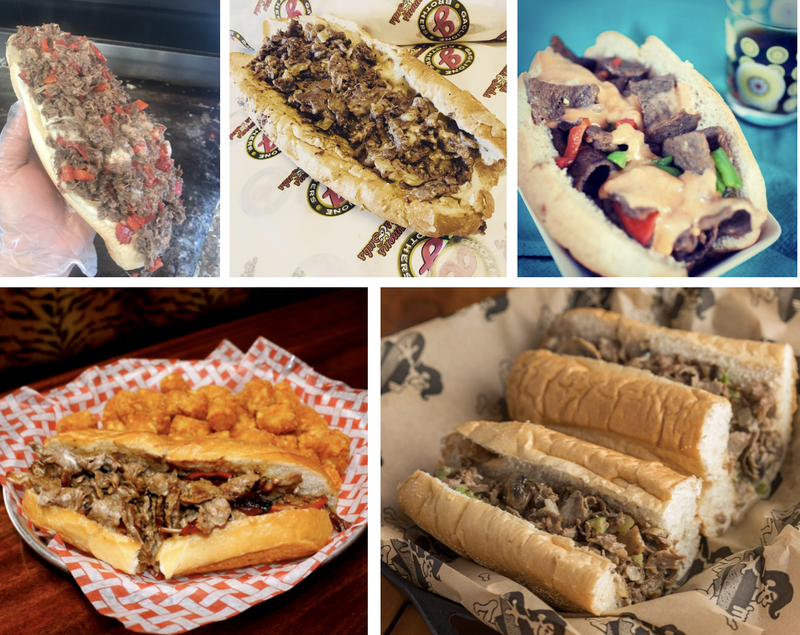 Check out this map of our 15 favorite cheesesteaks from all over America's Finest City and get out there and get one! For the record, my go-to cheesesteak order is beef with provolone, the works (peppers, onions and mushrooms) and hot cherry peppers if they got'em, which they always should. I'll happily take American cheese once in awhile, but whiz is for tourists. If I was left to my own devices, I'd probably eat a few every week. Below is the list of my favorite places to grab a cheesesteak sandwich from all around San Diego County. 1. Calozzi's Cheesesteaks - This newcomer has already reached cheesesteak glory in Seattle and is now taking San Diego by storm. A no-frills spot, Calozzi's is the brainchild of Philly-native Al Calozzi, who you'll catch clinking spatulas behind the flattop. These cheesesteaks are huge and delicious, with probably the best meat-to-bread ratio of any sandwich in town. Tell him SanDiegoVille sent ya! 2. Giorgino's - A Golden Hill staple since 2007, this casual sandwich shop does it right, from breakfast sandwiches to burgers, but its the cheesesteaks that keep people talking. The eatery even serves cheesesteak fries and has a most-fantastic pork roll egg and cheese sandwich! 3. Alex's Brown Bag - A walk up window located inside the relaxed bar of Latitude 32, Alex's Brown Bag makes an array of sandwiches, burgers, and their specialty - cheesesteaks. Owner Jim Mullen hails from the suburbs of Philadelphia, growing up on the most famous cheesesteaks in the world, and he does his hometown proud with his take on the classic sandwich. We published our top cheesesteaks in San Diego article today, and after an outcry of support for @1steaknfries in Pacific Beach, we immediately headed over for a sandwich. We are happy to report that the new eatery is now on the list! Check it out at SanDiegoVille.com! 4. Steak N Fries - Originally not on this list, we had an outcry of support for this place after posting a link to this article on our Facebook Page, so we immediately got a sandwich. Another Pacific Beach eatery, Steak N Fries uses exceedingly fresh ingredients, from house cut ribeye to crisp vegetables to fluffy Amoroso rolls. We ordered a cheesesteak with peppers, onions, mushrooms and griddled cherry peppers and it passed the test. The owners are Philly natives to boot! 5. Surf Rider Pizza Co. - First opened in Ocean Beach in 2010 by Hilary Rossi, Surf Rider Pizza Co. is now owned by The Patio Group and is in the process of expanding to Crown Point, Mission Beach and La Mesa. In addition to tasty NY-style pizza, the eatery makes excellent cheesesteaks, as well as a cheesesteak Stromboli that is not to be missed. 5. Monkey Paw - Opened by Scot Blair in 2011, purchased by Coronado Brewing Company in 2017, and up for sale as of last month, this East Village brewpub knows how to make a cheesesteak. Our go to order is a full size West Coast Cheesesteak, add serranos, washed down with one of their freshly brewed craft beers. 6. Gaglione Brothers Famous Steaks & Subs - A San Diego destination since 2004, this authentic sandwich shop has two area locations run by three brothers and boasts an awesome pepper bar. Go for The Works cheesesteak, and be sure to get a side of jalapeño cheese fries. You won't be disappointed. 7. Bub's At The Beach - This neighborhood dive makes surprisingly bomb bar food, including some of the tastiest tots in town, and the Pittsburgh Steak sandwich may be the best of show. Be sure to get it "all the way" to get your necessary dose of grilled vegetables. 8. Anthem Vegan - A vegan cheesesteak?!? Why, yes! If Anthem made all my meals, I'd happily go vegan. This farmers-market-turned-brick-and-mortar, plant-based diner could please the most blood-thirsty carnivore with its expansive menu of breakfasts, tacos, burritos, sandwiches, salads, burgers, and more. Try the Philly cheesesteak sandwich - you won't miss the meat! 9. Philly Franks - A family owned and operated establishment, Philly Franks is a San Marcos destination that offers a simple menu of authentic East Coast-style hoagies and Philly cheesesteaks (there is even a vegetarian cheese'steak'). The eatery also sells Tasty Cakes and Wise potato chips. You must come try this place!! 10. Taste Of Chicago - This adorably quaint eatery in San Diego's Mount Hope neighborhood makes an array of Chicago-inspired eats, from hot dogs, to burgers, to fried baskets, to gyros. Althought their cheesesteaks are delicious as-is, it's their crispy cheesesteak wrap that brings us back. Like a mix between an eggroll and a chimichanga, this behemoth is filled with gooey delciousness and can be made with steak or chicken and all the fixins'. 11. Philadelphia Sandwich Company - Philly native Joe Creszenzo has been serving up some of San Diego's top cheesesteaks since 1979. Head by the family-owned eatery and pick up a Joe Special Cheesesteak. The pastrami sandwich is also delicious! 12. Philly Steak Subs - This El Cajon Sandwich shop originally opened in the 1970s before being puchased by longtime restarateur Elias Totah in 2002. The small, family-run operation serves a bunch of tasty sandwiches, but its the Philly cheesesteaks that are the specialty. We suggest the Philly Cheese Steak with the works (NO AVOCADO, bc that's no bueno). 13. Jersey Mike's Subs - Usually, I would not include a chain on a list like this, but I'd be lying if I said that Jersey Mike's didn't serve one of my favorite Philly's in town. We always opt for the Big Kahuna, although we prefer the chicken version over the beef in this instance! 14. Lefty's Chicago Pizzeria - Okay, I know it's not technically a cheesesteak, but Lefty's Italian Beef with provolone checks all boxes and is a fantastic sandwich. Come on, tell me that you wouldn't guess cheesesteak if I fed it to you blind folded? Either way, it's awesome. 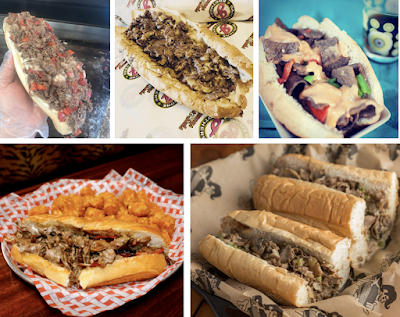 Did we miss any amazing cheesesteaks?! If so, please let us know my emailing CheeseSteaks@SanDiegoVille.com!